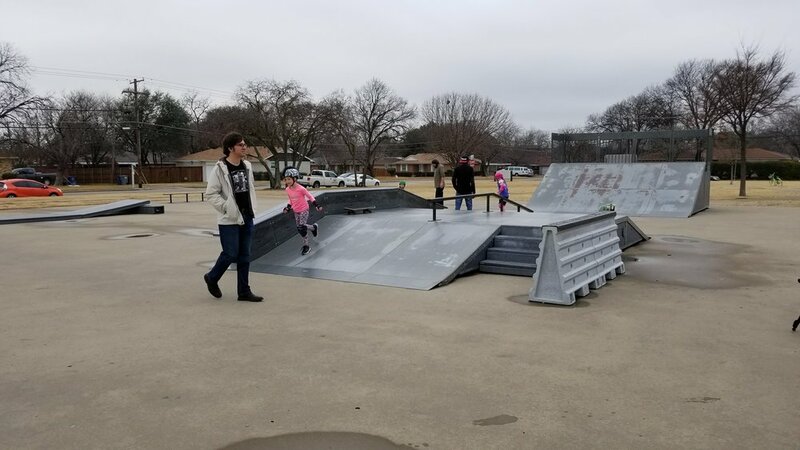 Thank you to photographer and skate mom Carrie Smith for the picture below of kids practicing their new skills at the only public skatepark in Dallas. And this may be news to you, that a city as big as Dallas only has one public skatepark, while surrounding towns are well appointed. You might also notice the rust on the ramp, which is the inspiration behind Skatepark for Dallas's mission to build amazing, public skateparks in Dallas. St. Francis skatepark is located in East Dallas at Lakeland Hills Park. It is along 2600 St. Francis Ave in a nice residential neighborhood with wonderful, active neighbors. The park is a popular destination for all the typical park activities, including soccer, tennis, baseball, and neighbors getting fresh air with their kids and dogs. All the best skateparks are permanent, built using smooth, poured-in concrete, designed for both safety and fun, and often include ride-able sculpture that reflects the unique history of their city. St. Francis was built on a concrete slab, using modular skate ramps that allow for a park to be constructed quickly and economically. Modular ramps have a design lifespan of about 10 years, and St. Francis' ramps are well past their intended life cycle. They have been well loved by the skaters (youtube). 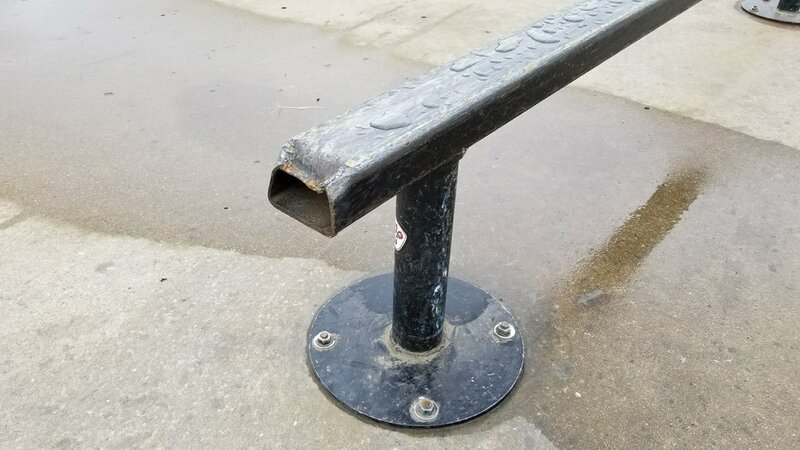 So loved, local skaters even attended a City Council Town Hall to advocate for safety upgrades at St. Francis because equipment is worn and damaged. The kids who learn to skate here love st francis. The city is lucky to have the park, but we know it can be better. The design and features (and their shortcomings) were one of the inspirations for Skateparks for Dallas. Skateparks for Dallas is a project started by life long Dallas resident Clinton Haley, and supported by the Dallas Parks Foundation, a 501(c)(3) non-profit. Clinton, a doctor, a father of three, and a skater was inspired by the passion for skating he found at local parks, and noticed the gap in Dallas' community. Clinton approached the city and the Dallas Parks Foundation, and together they worked with the city to secure $4M in funding for a new skatepark that is planned to be located at Bachman Lake. Dr. Clinton Haley skating a bowl with friends. A true public amenity, where families can skate together, or just watch the talented young people of the city of Dallas, together with benches and shade. After completing the first park, Skateparks for Dallas will work with the city, skaters, the parks & recreation department, and local companies to ensure that the park is well programmed. Of course this programming will require funding (Donate to Skateparks for Dallas via the Dallas Parks Foundation). Creating a regular cadence of skate lessons, contests and music at the park can turn the skatepark into a true hub for the cities cultural and athletic communities. We also will work with the city to get a Skate Park Master Plan for the City of Dallas created. A Master Plan can help layout the larger skatepark opportunity for a city, and our neighbor city Arlington created a skate park master plan that can be a good illustration of how a city might use such a plan. The city is currently planning the new skatepark at Bachman Lake. This is a great location for a flagship skatepark, as it is an existing recreational venue, the views are beautiful and there is parking and DART rail access already. Read more about our visit to the Bachman Lake skatepark site here. Skating is a very common amenity in our neighboring cities. Over 300,000 square feet of skatepark have been built in the Dallas suburbs, most since 2013. The closest suburban park to downtown Dallas is a half marathon (13.1miles) away. Map of the public skateparks in DFW here, including size and address. The park at Bachman Lake will dramatically improve access to a premier skate facility for all Dallas families. Newer PostWhat is your favorite skate park in Dallas?